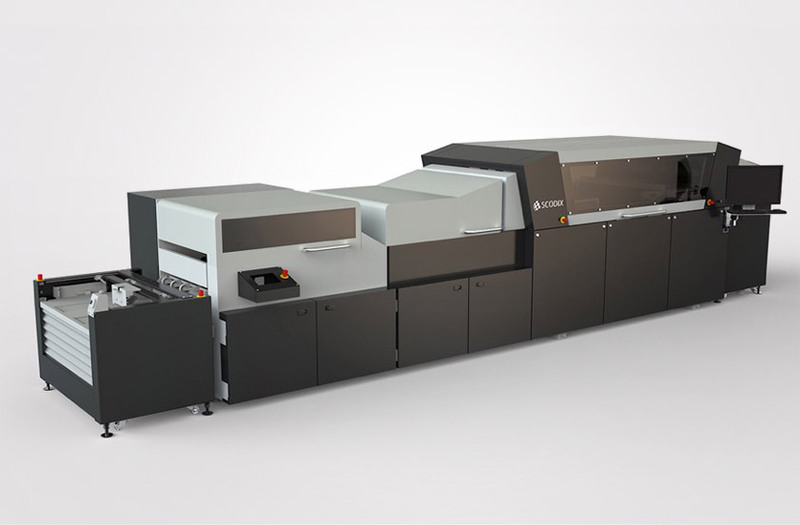 Glenview, Illinois – May 20, 2016 – Dreamworks Graphic Communications, LLC, the leader in conventional UV offset printing and digital offset printing announced today the installation of the United States First Scodix Ultra Pro with In-line On-Demand Variable Foil System. Dreamworks new Scodix Ultra Pro produces post digital enhancements for their conventional UV offset and digital offset printed materials. The UV dimensional coating unit is capable of printing dimensional UV coatings up to 250 microns thick with 99% gloss clarity with multiple coating levels in a single pass. The in-line foil unit can lay down up to 4 different foil colors at a time, anywhere on the sheet including over the dimensional UV coating for dimensional foil effects. Foil can be applied from the size of a dot to 19.86” x 29.5” with intricate patterns and fine lines for foil effects never seen before! Foils can be applied as variable data and/or variable images! Using a unique patented foiling process, Dreamworks new Scodix system is able to digitally produce professional results that match, and often transcend, quality standards and capabilities (variable data and images) of either traditional hot foil or cold foil processes which use dies to apply static only foil. Dan Luka, CEO and Co-Founder of Dreamworks stated “Dreamworks has a reputation for innovation and world-class quality. Being on the forefront of new technologies allows us the ability to provide our client partners the printing industries newest products and capabilities”. “Dreamworks is known for our creativity and the ability to push the envelope for complexity and doing the impossible” says Luka. “We do the kind of work that many print communication companies don’t take on. Scodix fits right in with what Dreamworks is all about. This device has two great functions, first it simplifies the complexity of UV coatings and traditional foil stamping and second the applications go way further than the traditional value added services. The ability to produce variable on-demand foil, foil on foil, tactile materials, cast & cure, and dimensional UV coatings up to 250 microns thick are all very unique. The entire team here at Dreamworks is very excited about this new technology. Our new Scodix System is a great fit for us and our clients”. Dreamworks Graphic Communications is a world-class and full service commercial printing company located just outside of Chicago. The company was built on the idea of applying cutting-edge graphic arts technologies and craftsmen level production personnel to produce the highest quality and most unique printed materials to deliver maximum results for their nationwide clientele. Dreamworks production department features some of the industries most advanced printing equipment. Their printing equipment includes 40 and 41 inch 6 and 7-color full UV conventional offset printing presses and digital offset printing equipment up to 29.5”. © 2016 Dreamworks Graphic Communications, LLC. All rights reserved. Previous Blog and News : Print Preforms Like No Other Form of Communication! Print Preforms Like No Other Form of Communication!